The MySQL Campus Tour got reinforcements. Dups is not alone anymore. He is being joined by Colin and Farhan. Sheeri and yours truly are in Los Angeles, just about to travel to San Luis Obispo, where we will be guests of Cal Poly. The lecture is scheduled for tomorrow, April 14th, at 11am. 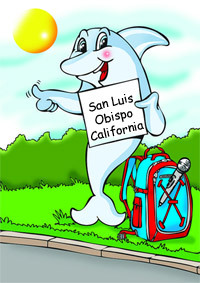 The address is 1 Grand Avenue, San Luis Obispo, CA 93401. Here's a reminder of the events to come. Again, if you are in the area, come along! Attendance is free, and if you want to participate actively, you will be very welcome!